The nation received a crash course in Red Sox lore last October, as the team started to wake from an eighty-five-year nightmare, only to see another season end in disaster. That history is torturous, to be sure, but many of the details making the rounds were wrong. No fans are more conscious of the past than New Englanders, but, paradoxically, none have absorbed as many inaccuracies. The dawn of another season presents a fine opportunity to clear up a few persistent myths. 1. 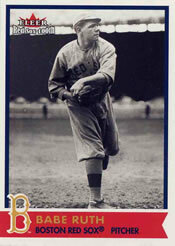 Harry Frazee sold Babe Ruth to finance No, No Nanette. In 1917, Broadway producer Harry Frazee bought the Red Sox. On January 3, 1920, he made baseball's most notorious swap, sending the Babe to the Yankees for $100,000 in cash and a $300,000 loan. This move started the alleged “Curse of the Bambino,” a spell supposedly responsible for the sequence of calamities since then. Legend has it that he made the deal to finance the hit show No, No Nanette. Not true. At the time of the Ruth trade. the show's author, Vincent Youmans, was an unknown rehearsal pianist, and the musical had not been written. No, No Nanette first appeared on Broadway more than five years after the trade, and the two had no direct connection. Further, the Curse itself is a modern invention; no reference appeared in print until 1986. 2. The Red Sox got worse after dealing Ruth to the Yankees. Contrary to nearly every modern citation, the Red Sox improved after the deal. In 1919, the team finished in sixth place with sixty-six victories. Rid of the Babe, whom some considered a bad influence, the Sox moved up to fifth place with seventy-two wins in 1920. The following year they improved again, finishing with seventy-five victories – the same total the team achieved in the championship 1918 season. The Red Sox didn't hit the skids until the 1922 season, which began a dreadful twelve-year drought. Numerous personnel decisions led to this change in fortune. It is more accurate to link the Ruth trade with the Yankees' ascent than with the Red Sox's demise. 3. Johnny Pesky lost the 1946 World Series by holding the ball. For the past fifty-eight years, Boston shortstop Johnny Pesky has lived with the stigma of blowing the 1946 Series by hesitating before throwing, while St. Louis runner Enos Slaughter scored in the eighth inning of Game 7. Even fans born long after that game recognize Pesky as culprit in the defeat. Pesky's teammates and Slaughter testified afterward that the infielder was not at fault. Reviewers of film of the decisive play have vouched for this, suggesting that he could not have prevented Slaughter from scoring. Further, the Red Sox had the potential tying run on third base with one out in the top of the ninth, but failed to score. 4. The Red Sox lost the 1975 Series because Darren Johnson brought in the wrong relief pitcher in Game 7. The Boston manager raised a few eyebrows when he installed rookie Jim Burton to face the Reds in the ninth inning of a tie game. Many have cited this move over the years as the cause of the team's narrow loss to Cincinnati in the championship match. Burton had appeared only once in the postseason to that point and, as it turned out, pitched only one more game in his major league career thereafter. Still, Burton had the lowest regular season ERA on the Red Sox staff. The Reds had several left-handed hitters due up and Burton was the only lefty available to Johnson, who went by the book. The Sox blew a 3-0 lead before Burton entered that game. They also coughed up a 2-1 lead with two outs in the ninth inning of Game 2. That's why they lost the Series. 5. The Red Sox choked in 1978, allowing the Yankees to tie them and force a playoff for the pennant. Most Bostonians who were around in the ‘70s recall the 1978 season with particular bitterness, in large part because, it is said, their team fell apart to allow the Yankees to gain a tie at the end of the regular season. While the Red Sox did relinquish a large mid-summer lead in the standings, it was Boston, not New York that forged an amazing comeback to reach a tie after 162 games. The Sox won their final eight and twelve of their last fourteen games to overcome a 3.5-game Yankee advantage. It was the Bronx Bombers that lost their final game to force the tiebreaker. 6. The Red Sox lost the '78 pennant on Bucky Dent's home run. Light-hitting Yankee shortstop Bucky Dent hit a three-run homer in the playoff between the two teams, helping to lead his team to victory. Almost universally viewed as the man who turned Boston into Mudville that year, Dent's name has been synonymous with Red Sox anguish ever since. The game's winning margin, however, actually came on an eighth inning home run by Reggie Jackson. 7. John McNamara goofed by removing Clemens after seven innings in 1986's Game 6. Nothing can top 1986 for calamitous endings. The Sox were closing in on a final victory over the Mets (from New York, naturally), and their first World Series victory since 1918. They had a 3-2 lead and their ace, now legendary Roger Clemens, on the mound. Boston manager John McNamara called for his best reliever, Calvin Schiraldi. The Red Sox then lost the lead, forcing the game into extra innings. Clemens in fact had a blister and a torn fingernail on his pitching hand, which had started to bleed. Though he was lambasted afterward, McNamara used sensible judgment. Ironically, in making this move, McNamara did what future Boston manager Grady Little was vilified for not doing seventeen years later. 8. The Red Sox would have won the Series if McNamara had replaced Bill Buckner on defense late in that game. There is no more eminent symbol of the agony of defeat in the American mind than the picture of Bill Buckner's ill-timed error later in Game 6. Buckner was playing on two bum legs, and McNamara had swapped him for defensive specialist Dave Stapleton toward the end of each of Boston's postseason victories to that point. This time Mac left Buckner in the game. While failure to relieve the gimpy first baseman may have been the dumbest managing decision since the Bay of Pigs, it didn't lose the '86 championship for the Red Sox. Many have forgotten that Buckner's blunder happened after the Sox had already blown a 5-3 two-out lead in the tenth inning. Once that was gone, the Mets had two considerable advantages: home field and a superior bullpen. The Red Sox were likely to lose Game 6 even without the error. Further, they still had a great chance to win Game 7, but didn't. 9. Buckner was a one-dimensional player with limited skills. Quick – who had more career hits, Ted Williams or Bill Buckner? The answer is Buckner. He had more hits than Jimmie Foxx and Ernie Banks too, and 300 more than Mickey Mantle. Over 22 seasons he compiled a .992 fielding percentage and stole 183 bases, better than all four of those Hall of Famers on both counts. In 1986 he ranked among Red Sox leaders in RBI and fielding percentage, and – get this – despite his physical limitations, stole more bases than all five of the team's outfielders combined . Buckner may be remembered for missing a certain ground ball, but he was among the better all-around players of his era. 10. Grady Little screwed up by leaving Pedro Martinez in the game. While myths veer away from the truth, some don't drift very far. Here, the facts don't provide much relief for Mr. Little. The Boston manager entered the Red Sox Hall of Shame by failing to replace his tired starting pitcher in the eighth inning of last year's Game 7 showdown with the Yankees. The Sox had a comfortable lead, and New England fans were quietly preparing to celebrate the end of the Curse. One thing led to another and, needless to say, New York wound up celebrating that night. Though other decisions and events also contributed to the hideous loss, this was a bona fide gaffe, given the manager's information and options at the time. Ironically, while Red Sox fans made the correct call in assessing last season's ending, the intensity of the city's reaction sprang in part from a succession of misunderstandings about scapegoats of Octobers past. Ultimately, tragic finales all blend into one. Then again, those who misunderstand history are doomed to repeat it.